If you want to experience that ‘feel-good’ feeling at the end of a book and are looking for a light, pleasantly surprising read, pick this one up. Earlier this year, I had just finished two heavy novels, both on the topic of slavery and the struggle of African Americans today. Thus I found myself in desperate want of a ‘lighter’ read. 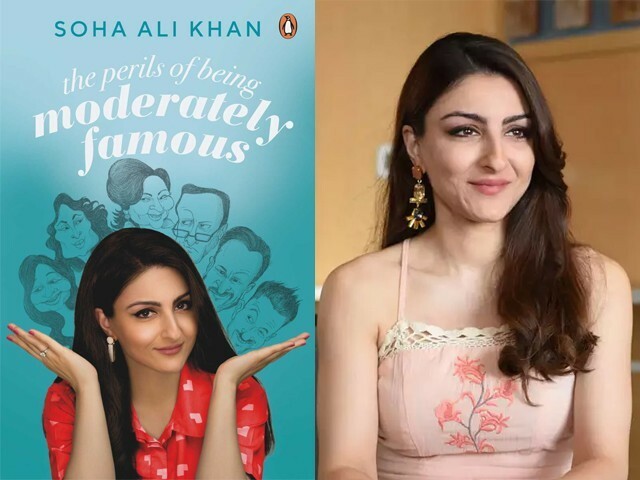 The Perils of Being Moderately Famous by Soha Ali Khan then came to my attention, and even though I read a review saying it was a pointless book, I’m glad I gave it the benefit of the doubt. I had my own assumptions of course. Soha is quite literally a royal, as she belongs to the notable Pataudi family. Thus the book begins by providing us with some background on her illustrious family. Her father Mansoor Ali Khan Pataudi, the Nawab of Pataudi, was also a former Captain of the Indian Cricket team and an Oxford graduate. Her mother is the Bollywood superstar Sharmila Tagore. Her brother is actor Saif Ali Khan, while her sister-in-law is actress Kareena Kapoor Khan. The entire family, including the power couple ‘Saifeena’, feature in the book briefly. Whilst some of the details about her family are not too engaging, other details, such as accounts of the strength and achievements of the women in her family, are an interesting read. Soha describes herself as “moderately famous” in comparison to her family, and shares the perils (and also the perks, I would add) of living alongside her mega famous family members. The book can in many ways be viewed as a tribute to her family; she is “grateful” to them, and believes they are the reason she is writing the book in the first place. Yet for me, Soha is the star of this book. Soha – literally meaning star – takes us through different phases of her life; childhood, university and work. Each essay is easy to follow and thoughtful in nature. I particularly enjoyed learning about her time at Balliol College, Oxford. Her extensive travels – notably when she travelled to Morocco, where she shared a tent with a winged creature and found herself momentarily abandoned in the Sahara desert, or the time she hitchhiked to Paris, quite literally risking her life. And of course, her stories and love for Mumbai, the city she calls home. During these chapters Soha recounts homesickness, the liberation that travel affords, and regrettable relationships in an honest way; decorated with mishaps and adventures anyone who has lived away from home can easily connect with. On trying to find her calling and place in the world, Soha recalls the angst she experienced in making the decision to leave her high-flying corporate career to becoming a working actor – a story perhaps many of us can relate to, as we navigate ourselves through the world’s diverse, ever-changing employment market, our own dreams, and the expectations of our family members. Over the course of the book, the celebrity and royal princess became very human and relatable. I liked that Soha did not shy away from claiming the movies that did not fare so well, as well as any embarrassing commercials from her past life, as her own. Just as she claimed the hits, particularly Rang De Basanti, a film that captured the heart of a generation and represents a changing era in India. What is perhaps the best thing about this book is that it is told with brilliant humour and genuine humility; I chuckled and laughed out loud throughout. The book was the unfolding of a celebrity – albeit a moderately famous one – humanising someone unattainable we see on big screens, usually looking very glamorous. Upon closing the book, I didn’t feel the need to question the sanity of humankind or become an activist (as I felt urgently compelled to do with my previous reads of 2018). Instead, what I was reminded of is that we each are individuals on our own journey, and yet we are not so different. Be it a superstar, someone moderately famous, or an unknown, we are all navigating the journey of our dreams; the trepidation, struggle and clumsiness is the same. In all honesty, this is not such a pointless lesson. On the other hand, after discussing the book with a friend who is a struggling writer, I do question the choice of big publishers who agree to publish books by celebrities, even moderately famous ones, whilst writers of real literary talent are turned away every day. But perhaps there is a market for both – I did after all need the light read after the heavy one. In conclusion, if you want to experience that ‘feel-good’ feeling at the end of a book and are looking for a light, pleasantly surprising read, pick this one up. You’ll meet less of a royal, and more of the girl next door.